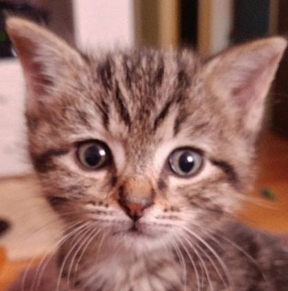 A male tabby kitten with a quiet and sweet disposition who loves to touch noses and will be sad when he is too big to sleep on your shoulder. His curiosity causes him to explore every small space or container when he is not running, chasing, jumping or carrying his mouse around. After an exhausting period of play, he loves to seek one out and curl up for a tummy rub and a nap.